It’s with great sadness that this flavor of Peter Rabbit Organics is the last of their organic fruit snacks that they sent us to product test. Peter Rabbit Organics 100% Organic Strawberry and Banana fruit snack are ideal for anyone – of course, with their packaging and coloring they are targeted towards babies and children, but there is no reason why an adult cannot consume them as well. They contain 100% organic fruit with no added sugar or artificial ingredients. They come in a convenient squeezable pouch – which makes them ideal as snacks on the go. The pouches are resealable which makes them a great snack whenever you are out and about or if you need something to stash in your desk drawer at work. 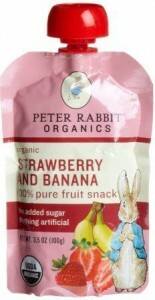 You can buy Peter Rabbit Orgaantioxidant-fruits.comcs, Organic Strawberry and Banana 100% Pure Fruit Snack, 3.5-Ounce Pouches (Pack of 10) through Amazon.com for $16.50 ($0.47 / oz). If you buy two 10 packs, then your order will be eligible for Amazon.com’s FREE Super Saver Shipping on orders over $25. Have you tried these fruit snacks? How did you like them?